Updated statement from BEF on Equine Influenza. “Further to the announcement by the British Horseracing Authority that horseracing will continue to be suspended until Wednesday February 13th, the British Equestrian Federation can confirm that our veterinary advice remains that it is not necessary to cancel other equine events at this time. Equine Influenza facts from EEA’s friends from Boehringer Ingelheim, the veterinary company behind Equitop Myoplast and GLME. 1. There have been 30 reported equine influenza outbreaks in the UK, Ireland, France, Germany, and Belgium between December 2018 and 7th February 2019 (Twitter, 2019; RESPE, 2019). There have been more outbreaks across Europe in the last 3 months than there have been in the last 2 years so vaccination against equine flu is more important than ever, check your passports and talk to your vet. 2. Equine flu is endemic in Europe and North America which means that horses are at risk of being exposed to flu all the time. It is important that at least 80% of the horse population are vaccinated against equine flu to provide adequate herd immunity and reduce the risk of an epidemic occurring (Paillot, 2014). 3. The equine flu virus can also be transmitted on clothes, tack, yard equipment and in troughs and feed bowls which means that horses can continue to be infected after the infected horse has gone (American Association of Equine Practitioners, 2017). This means that biosecurity and stable hygiene is critical- contact your vet for advice especially if you are travelling horses. 4. Horses do not need direct contact with another horse that has flu as the virus can spread through the air at distances of 2km (Davis et al. 2009). This means that they do not need to have nose to nose contact to get flu. 5. All horses are at risk of flu even if they don’t leave the yard. Other horses travelling to and from the yard, even those that are vaccinated, can pass on the flu virus without showing any signs themselves (Paillot et al. 2016). Make sure your youngstock, broodmares and retired horses are also vaccinated, don’t ignore them just because they are not competing. 6. Did you know that equine flu is a serious and highly contagious disease which can spread quickly between horses (Paillot, 2014)? The classic signs of equine flu are a harsh dry cough, a fever, nasal discharge and depression and most unvaccinated horses will shows signs of equine flu within 1-5 days after infection (AHT, 2019a). Equine flu can spread rapidly so ring you vet immediately if you notice any of these signs in your horse. 7. 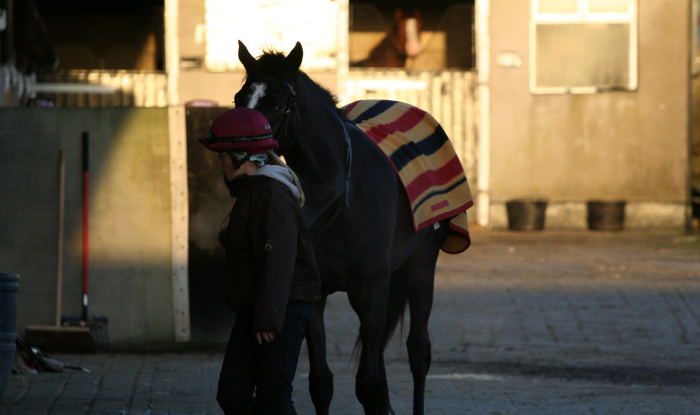 Did you know that not all horses with equine flu will show obvious signs? The classic signs of equine flu in unvaccinated horses are a harsh dry cough, a fever, nasal discharge and depression however horses that have been vaccinated may only show mild signs such as poor performance, lethargy, nasal discharge and possibly a cough (AHT, 2019b). Equine flu can spread rapidly so ring your vet immediately if you notice any of these signs in your horse. The EEA looks at some biosecurity measures to help prevent the spread of the disease. Equine Influenza has always been a threat among horses, as has Strangles, EHV and many more. The risk increases for busy yards especially for the competition yard and ones where the throughput of new horses is high. The difficulty with many viruses and bacterial infections is that they are not visible to the naked eye and horses can be infectious for a number of weeks before any symptoms are apparent. By having sensible and sustainable steps in place we can reduce the risk of horses becoming infected, and if horses do become infectious we can minimise the risk to other horses on the yard. - It is good practice to routinely take and record the rectal temperature of all horses twice daily, which should be ≥38.5°C/101.3°C. This way you can immediately recognise a horse with an increased temperature (also referred to as pyrexia). If you are worried please call your vet, even if it is for advice. - Avoid sharing equipment without having disinfected items between each horse. Similarly if you are suspicious about any skin infections such as ringworm avoid using the same brushes, saddle pads or tack to prevent spread of infection. - New horses coming onto the yard should be routinely isolated. Yards should be able to organise a remote corner of a yard, or a paddock where new horses can be quarantined ideally for three weeks. It is also good practice to take a blood sample. - It is important not to move horses off premises where an infectious disease has been recently diagnosed as seemingly healthy animals may be carrying the disease. If these horses are taken to events they could spread infection to other horses. - All horses, including field kept ones, should be vaccinated. - Try not to let horses touch noses and avoid touching other people’s horses yourself. - Disinfect your transport afterwards — ask your vet about suitable disinfectants. - If you are staying overnight disinfect the stables before putting your horse in them (there are easy to use sprays available for this) and ensure that horses can’t make contact with their neighbours. Out breaks of equine influenza are not only debilitating for the horse concerned but can also have devastating effects on the whole yard and business. Common sense, prevention and precaution is key.